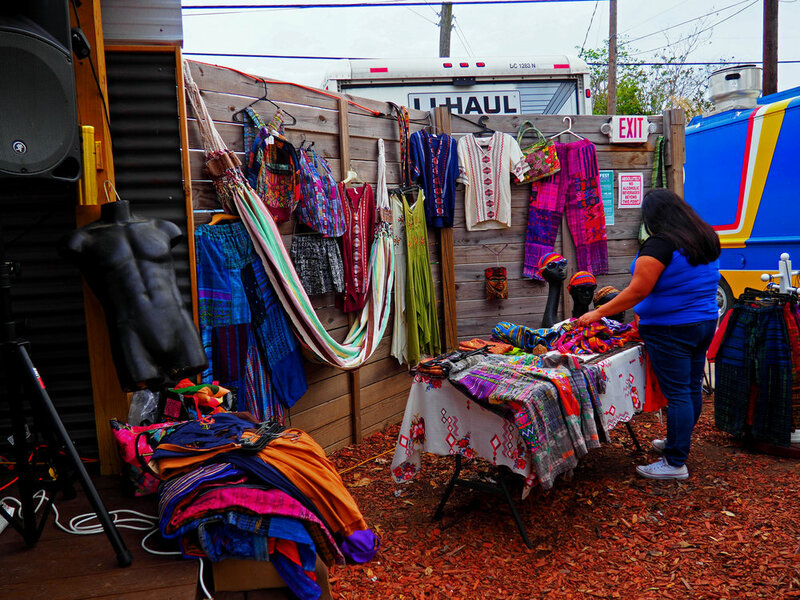 On Friday, March 10, Las Ofrendas, an Austin based organization that uplifts and empowers people of color through fair trade enterprise, organized Frida Friday, a marketplace for femmes of color to showcase and sell their artwork and clothing. Poco a Poco served as the event madrina while collaborating with Turkish restaurant Kebabalicious. Held in the cozy enclosure behind Kebabalicious, the event included Resistencia Bookstore, Las Ofrendas and Hermanitas Boutique, all of which sought to use the space for women of color whose work might otherwise go unnoticed. The event also featured a raffle and giveaway with proceeds going to Mama Sana/Vibrant Woman, a community-based organization that works to improve access to quality pre and postnatal care for women of color in the Austin area. As a predominantly white city, Austin boasts a creative scene that, while very active, tends to be whitewashed, excluding the work of people of color, and especially women of color. Frida Friday Mercado is a way to combat this issue by carving out a space for women of color to present their work. “People are forced to engage with the work of women of color here, you don’t have a choice to skip over their work, and that’s really unique to this experience here,” says Cindy Elizabeth, a photographer and mixed media artist. Women in the white, male dominated art field face obstacles from different fronts, whether it's male colleagues getting more exposure and support from the community or women of color being ostracized for existing in a gentrified and segregated city. “Vending at spaces with few women of color can be a uncomfortable, but today I felt really great,” says Alma Ramos of SOMAR ATX, an online shop dedicated to the Xicanx experience. “It might be because our products don’t resonate with them [because it is intended for latinx], so it makes us feel a little awkward,” Julie Ramos of SOMAR ATX says. SOMAR ATX brings artistic gear to support the cause. Though the problems people of color face daily aren’t new, it’s important to find a way to intentionally engage with and include our cultures in our lives. “Our work is 100 percent inclusive of our culture,” Alma Ramos says. “It’s especially important for us to represent our culture through our work because minorities in Austin are being displaced. It’s weird how there’s so many of us, but we aren’t being represented or acknowledged." Culture-specific nostalgia is a driving factor in the creation of many of these businesses and projects. “All of my art is inspired by my life and experiences as a black woman,” Elizabeth says. “Maxine Shaw, the only dark-skinned women on ‘Living Single,’ I looked up to her. She was my everything as a little girl,” Elizabeth says. Identity and cultural heritage also prompted the creation of SOMAR ATX. “It was around the time I started identifying with the Xicana culture and coming to terms with it, that I made my first ‘Xicana’ t-shirt,” Alma Ramos says. The next installation of the event will be from 6:00 to 10:00 p.m. on Friday, April 14.